Just over 10 minutes’ walk from Gumusluk Villa is Victoria’s. It’s a whole complex and not just a beach front bar and restaurant: it incorporates a swimming pool and riding stables with its small exercise area and on our visit in April 2013 they had just completed some accommodation units. 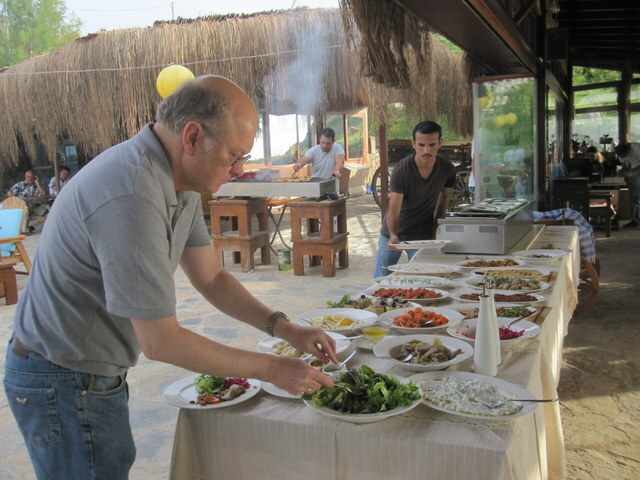 Every Sunday they serve a barbecue/buffet for 30TL per person. 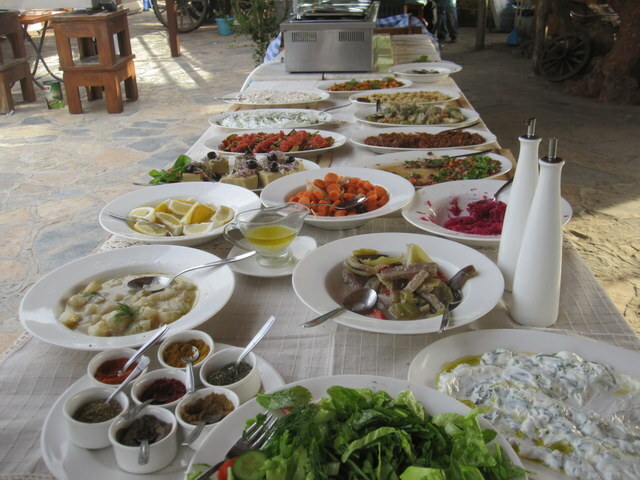 For your 30TL you can sample an excellent array of starters, including bean dishes, salads and dishes using fresh vegetables. Follow this with meat from the barbecue and rice and bread. We sampled their chicken kebabs and wings – had hoped for a bit more variation – but were both good. The house wine at 35TL a bottle was good value. With live music – two talented guitarists on this occasion – it was a pleasant evening. Breakfasts at Victoria’s are also popular. For a full Turkish style breakfast (bread, butter, jam, honey, egg, cheese, olives, cucumber, tomatoes and tea or coffee) they charge 20TL for adults and 10TL for children. They also include a free 10-15 minute horse ride (around the exercise area) for children. Adults pay 40TL for half an hour. The cost for the swimming pool is 10TL per person. You can rent sun loungers at a small cost or ‘platforms’ (a comfortable area with cushions for up to 4 people) at 200TL per day. (up to 190TL of which can be spent at the restaurant or bar). The excellent manager, Seyda, is well known in Gumusluk and is very welcoming. She speaks extremely good English as does Esra who is working there this season and is also very helpful. It is always worth booking in advance, especially for the Sunday buffet/barbecue (+90 252 394 3264). 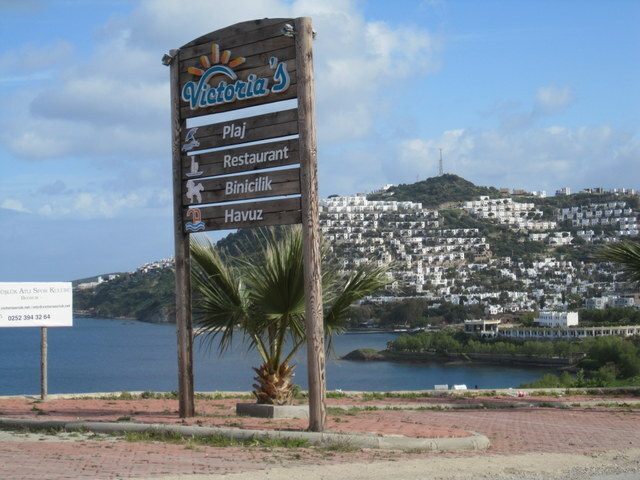 This entry was posted in Activities, Food and Drink and tagged Activities, Beach BBQ, Bodrum Peninsula, Food and Drink, Gumusluk, horse riding, live music, Restaurants, Turkey by Val Smith. Bookmark the permalink. We went to a BBQ night at Victoria’s last year, it was a fabulous night. The food was delicious.. I could have just filled up on Meze. The setting is really relaxing, and Victoria is a gracious hostess.